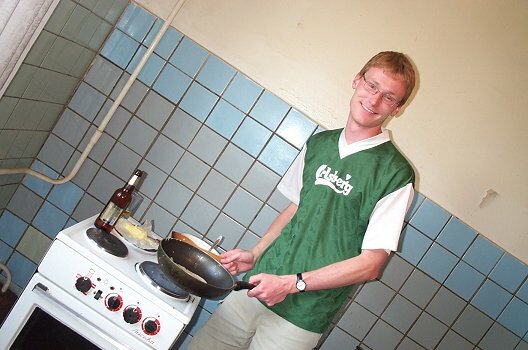 On this page you can find my famous recipe for making pancakes with beer - Danish beer of course. I have translated the recipe into several languages for fun, and you are free to use it. If you can translate the recipe into a language not mentioned here, I would be very thankful! The pancake I am making on the pictures above, was produced in the domitory I was living in Moscow in the summer of 2003. Stir flour, milk and beer to a levelling. Ad eggs, sugar and the 20 g melted margarine. The pancakes are now ready to be cooked. Rør mel, mælk og øl til en jævning. Tilsæt æg, sukker og 20 g smeltet margarine. Pandekagerne er nu klar til bagning. Перемешать муку, молоко и пиво. Добавить яйца, сахар и 20 г расплавленного маргарина. Блины теперь готовы к выпеканию. Dokładnie wymieszać mąke, mleko i piwo. Dodać jajka, cukier i 20 g stopionego masła. Smazyć naleśniki do uzyskania przypieczonego koloru. Rühren Mehl, Milch und Bier zusammen zu eine Andicken. Zusetzt Eier, Zucker und 20 g zerlässt Margarine. Der Pfannkuchen ist nun fertig zum Backen. Mescoli la farina, latte e birra ad un livellamento. Aggiunga le uova, zucchero e la margarina fusa. I pancake ora sono pronti ad essere cotto. Primero bate la leche, la harina y la cerveza hasta incorporarlos; agrega los huevos (blanquillos) y la margarina derretida. Ahora ya puedes cocinar tus panqueques. Roer meel, melk en buur tot dit goed gemeng is. Voeg dan die eiers, suiker en die 20 g gesmelde botter by. Die pannekoekke is nou reg om gebak te word. Meng de bloem, melk en bier tot een gladde mengsel. Voeg de eieren, suiker en de 20 gram gesmolten margarine toe. De mengels is nu klaar om pannekoeken mee te bakken. Змішайте муку, молоко та пиво в однорідну масу. Додайте яйця, цукор та 20 г розтопленого маргарину. Тепер млинці можна випікати.